The Archivists at the Burke Library are offering internships this Fall to those currently enrolled in a master's program! For more information, please see the Internship Advertisement. This entry was posted in Collections and tagged interns, internship advertisement, internship opportunities on July 30, 2013 by Brigette C. Kamsler. 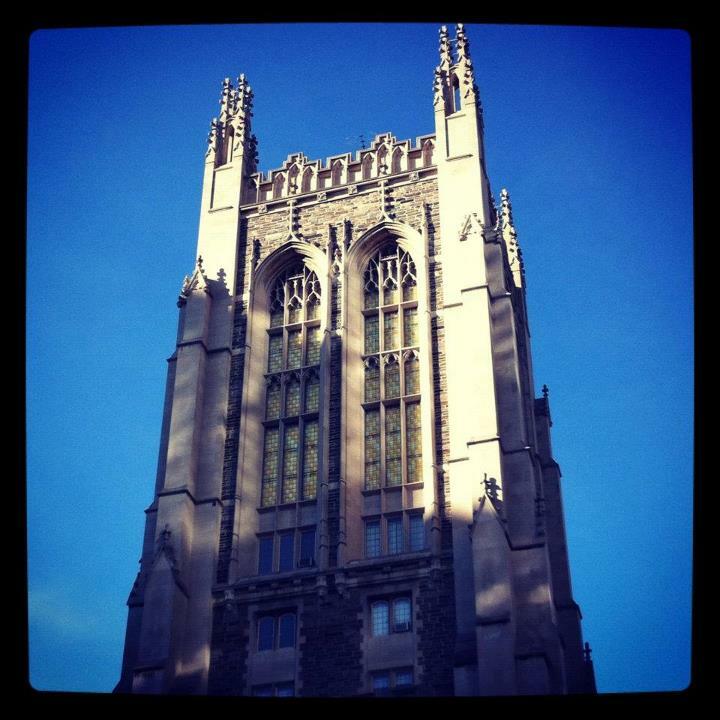 The Burke Library has become a destination site for some New York City students recently. During the last week of June and first weeks of July, nearly eighty students from two NYC Community Colleges visited the Burke Library and Union Seminary as part of their current course of studies. The students were in three separate English as a Second Language (ESL) classes, and came from over half a dozen countries, including China, Ukraine, and the Dominican Republic. One of their main assignments was to read Flying Over 96th Street by Thomas Webber, which recounts Webber’s childhood when he lived at Union Theological Seminary and later in a neighborhood in Harlem in the 1950s and 1960s, while his father worked at Union Theological Seminary and later at the East Harlem Protestant Parish. The students’ visit contextualized the book, and provided an opportunity for them to experience a prestigious, large, and important library collection and space. As the tour groups departed, they were very happy to have had the chance to visit the Burke Library, and many asked when they could return! This entry was posted in Collections on July 24, 2013 by Anthony Elia. On July 2, the Burke Library participated in the Researching Early Modern Manuscripts and Printed Books NEH Summer Seminar. The four-week seminar was sponsored by the CUNY Graduate Center and provided an opportunity for 16 scholars to develop their skills in the area of bibliography (the study of books as material and cultural objects) and book history. 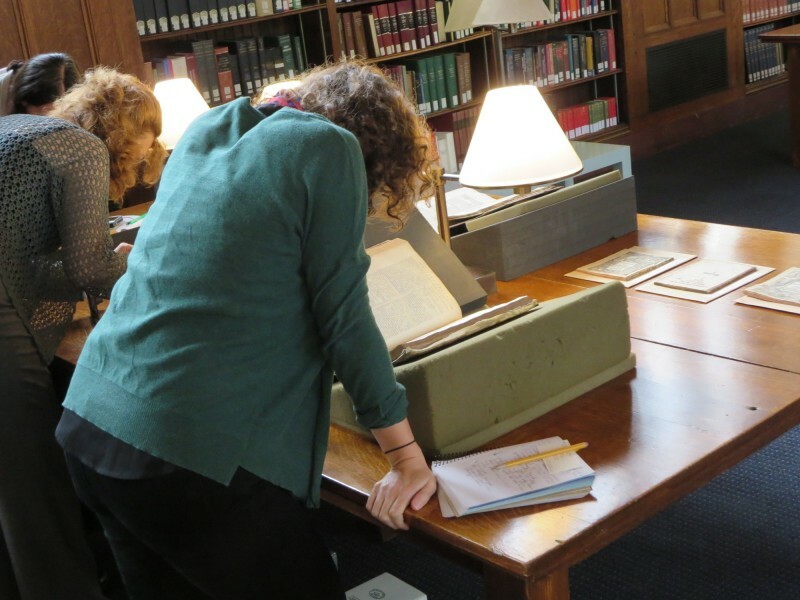 In addition to instructional sessions addressing subjects such as codicology, provenance, and analytical bibliography, the seminar included visits to New York City libraries with distinguished special collections relevant to the study of the early modern era. The goal of these visits was to allow participants to learn about the many collections in the city and in particular to gain hands-on experience working with manuscripts and early printed books. The seminar's visit to the Burke Library focused on the McAlpin Collection of British History and Theology. The McAlpin Collection is among the most significant of its kind, covering the years 1501-1700 and comprised of more than 19,000 items addressing the many theological, political, ecclesiastical, and philosophical controversies of the period. The collection was funded by David H. McAlpin and his family, and was developed early on by Ezra Hall Gillett, Charles Augustus Briggs, and Charles Ripley Gillett. Initially focusing on late 17th century Deism, the collection was soon expanded to include books, pamphlets, and broadsides from the English Reformation, Civil Wars, Commonwealth, and Restoration. The collection is remarkable for its depth and breadth, and researchers are able to examine important works in multiple editions, as well as multiple works by a particular author or pertaining to a particular issue or debate. Included in the collection are a number of very rare works, including an almost complete set of publications from the celebrated Marprelate controversy of 1588-89. At the workshop, insights into the binding structures and conservation histories of items from the McAlpin Collection were offered by Alexis Hagadorn (Head of Conservation, Columbia University Libraries) and Jennifer Jarvis (Mellon Conservator for Special Collections, Columbia University Libraries). Several other volumes — including an incunabular Bible printed by Anton Koberger, a first edition of Foxe's Actes and Monuments, and several Luther pamphlets — were on display to allow participants an opportunity to explore the wide of range of bibliographical and historical evidence found in the Burke Library's special collections. This entry was posted in Collections on July 22, 2013 by Matthew Baker. It has been over a month since I began making the trip to the Burke Library Archives at Union Theological Seminary twice a week for my archival internship. Under the guidance of Brigette Kamsler I have learned an immense amount about the art of archiving. My fears from the first day (see 1st Day – New Internship) have been assuaged and allayed. Surrounded by acid free boxes both full and empty, surprises and variety abound. Most people seem to think the work an archivist does is stuffy and boring – let’s face it – most people have no clue what an archivist does! And I probably did not have much of one either prior to starting at Burke either. Over the course of the past six weeks I have begun to learn and really appreciate the tasks of an archivist: accessing, processing and organizing documents and ephemera into cohesive usable research aids; creating documentation of a collection’s organization and order; providing access to research materials (frequently primary sources) to library patrons through finding aids. Often, a collection is donated by an individual and the precise order in which the collection was donated is in fact part of the archival nature of the materials. Other times the material in a collection may have been amassed over a longer period of time by more than one individual or institution and so the archivist gets to embark on the task of creating order and imposing an organization schema on the materials. During my time at Burke I have had the opportunity to work on a sizeable collection – the Kagawa Toyohiko Papers. Kagawa was an early 20th century Japanese Evangelical preacher who traveled to the United States on speaking tours four times between the 1930’s and the 1960’s. The collection has undergone numerous rounds of processing and continues to grow as new materials are donated and further materials keep popping up in the Missionary Research Library collection. The most recent additions included correspondence with an American preacher Stanley Armstrong Hunter which were donated by a descendant of Mr. Hunter as well as extensive correspondences regarding Kagawa’s 1954 tour of the United States. The latter set of materials was unearthed in the unprocessed papers of the Missionary Research Library. While the nature of the material may seem dry or bizarre to many, the fact there was a world famous Japanese Evangelical preacher whose American National Committee headquarters were in Brooklyn, NY has been one of my most exciting factoids for the summer of 2013. Part of the job of an archivist is, as I mentioned earlier, to draft a collection finding aid. This finding aid lists not only what is in the collection box by box and folder by folder but provides background material on the subject matter, individual or organization the collection focuses on. Reading about Kagawa I found myself going down a highly enjoyable rabbit hole – I have read numerous slightly varied accounts of his childhood, his adolescence, his introduction to Christianity, his early years preaching in the slums of Japan. I have also been able to ever so slightly glean an idea of Kagawa’s changing beliefs and doctrine. The man lived in heady times not only in Japanese history but world history – he witnessed both World War’s, Japanese colonialism and the rise of Communism. His particular brand of Christianity took much of these events going on in the world into account. I have also found collections relating to Kagawa in other archives around the world. There is an archive and research center dedicated to the man in Tokyo, Japan. There are other small collections of papers of his followers in places like the archives at Southern Illinois University. For an individual who has always been curious about just about anything you put in front of her, the opportunity to chase down information and learn about an obscure former nominee for a Nobel Prize in Literature has been fascinating and dare I say exciting. Another project the interns working under Brigette Kamsler have been working on this summer is the extensive Missionary Research Library project. We are all taking bits and pieces of this large seemingly unwieldy collection of papers and beginning to create order and sense out of it. Brigette runs an incredibly well oiled machine with interns working collectively and individually on the massive MRL collection. Currently I am separating MRL administrative papers from the larger collection of archival materials and housing these in archival acid free boxes. While perhaps not the most exciting sounding task, I know my efforts are part of a larger project and I enjoy my work knowing it is part of a larger effort. Once the Missionary Research Library papers are completely available to the public, I will know I had a small part to play in that project. This entry was posted in Student Entry and tagged Burke Archives, Graduate Intern, interns, MRL12, Summer 2013, Union Theological Serminary on July 8, 2013 by Elizabeth Beller. 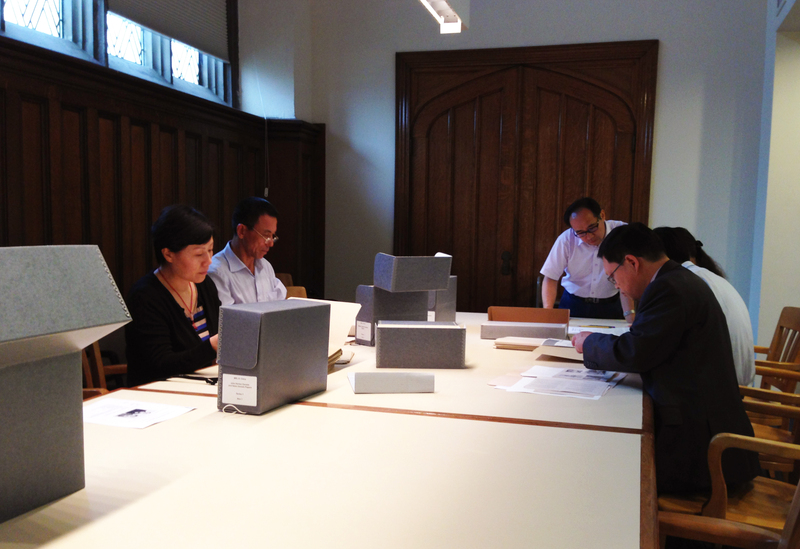 Today we welcomed six visiting Research Fellows from the Second Historical Archives of China (SHAC), located in Nanjing. The Burke Library archivist Ruth Tonkiss Cameron welcomed them to the Burke and gave a short tour of the facility. After that, the Fellows viewed and researched from a number of collections in MRL6 (China) including Miner Searle Bates Papers, 1927-1984; (John) Horton Daniels and Helen Daniels Papers, 1919-1956; and Matilda Calder Thurston Papers, 1902-1956. Ruth and the Luce project archivist, Brigette C. Kamsler, we were available for questions. Although their time at The Burke Library was short, everyone had a wonderful and information time! More information on SHAC can be found online: http://www.shac.net.cn/english/. This entry was posted in Collections on July 2, 2013 by Brigette C. Kamsler. A month has passed since I started at Burke as a summer intern, and I now find myself reflecting upon the last four weeks. While I came into this internship with previous processing experience, I have found that I am constantly learning something new at Burke, whether it’s learning how to wrap a book in acid-free tissue or to avoid using the word “miscellaneous” in a finding aid. Perhaps the greatest lesson I’ve learned is that the archive holds many surprises that are just waiting to reveal themselves. For the first half of June, I worked on a collection documenting the 1900 Ecumenical Conference on Foreign Missions. This conference ran from April 21 to May 1, 1900 and was held at Carnegie Hall and local churches in New York City. It was the largest formal religious event ever held in the United States and the largest international missionary conference ever. It brought together missionaries from around the world to discuss various topics, including evangelism, education, and geographical surveys of missionary work. One of the most fascinating aspects of this collection is the vast amount of documentation related to female missionaries, particularly in regards to “Women’s Work” sectional meetings. Processing the collection was relatively straightforward, as it largely consisted of two types of records: stenographic reports (essentially transcripts of entire meetings or sections of the conference) and conference papers (reports, papers, and addresses presented at the conference). As I began to arrange the collection chronologically, it became apparent that certain dates were not represented in the material. Particularly troubling was the absence of material from April 21, the opening day of the conference. I knew from the conference program that several notable people had given opening addresses on that date, and I was interested to read the addresses given by William McKinley and Theodore Roosevelt but resigned myself to the fact that these records appeared to be lost. For the last two weeks I have moved on from the Ecumenical Conference and have been working on the vast array of administrative records from the Missionary Research Library. When I arrived at Burke today I expected to continue with this. However, Brigette informed me when I sat down at my desk that she had found more material related to the Ecumenical Conference. As someone who loves to cross things off to-do lists, having to return to my first project was, as Brigette said when she informed me, “bad news.” However, I quickly came to realize that this surprise was in no way bad. As I sat at my desk reading President William McKinley’s opening address to the Ecumenical Conference, I realized that my previous definition of complete is insufficient to working in an archive. There are always going to be surprises and magically appearing material needed to be dealt with. I am looking forward to seeing what other surprises the Burke Archives have in store for me this summer. The completed finding aid for MRL 12: Ecumenical Conference on Foreign Missions, NYC, 1900 is now available online. This entry was posted in Student Entry and tagged Burke Archives, interns, MRL12, Processing on July 1, 2013 by Virginia Pastor.